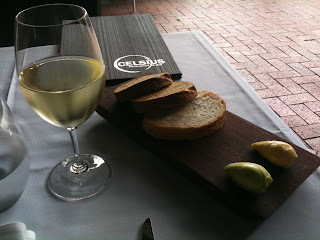 So, when I was in Adelaide for the Feast Festival, last weekend of November 2010, I stopped in to Celsius Restaurant on the way to the theatre. It had just received a review in the Adelaide Review which had more praise in it in a restaurant review than I’d possibly ever seen. Gouger Street was a real headtrip, dozens of restaurants side by side of all types. Cool and buzzy, yes, but a little strange to walk through a few blocks in the CBD with nary a soul in sight and then suddenly stumble upon the sanctioned street of social activity. In any case, it was early, I chose a table near the street, and settled down with a glass of 2008 Egon Muller Kanta Riesling, a wine from the local Adelaide Hills. Dear Lord, where do I find more of this? Clean, fresh, and flavourful. My strategy was how to taste as many things as possible before having to leave. 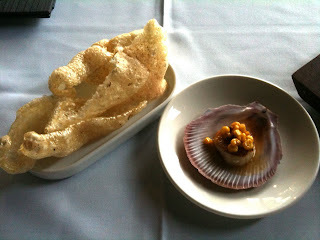 A few small tapas plates seemed wise. I couldn’t pass up the Bubbled Pork Crackling in a dust of yoghurt and fennel pollen. Crunchy-tasty-fat with a sweet-salty flavour. Good with the wine. A single scallop with corn and jamon was a perfect bite. 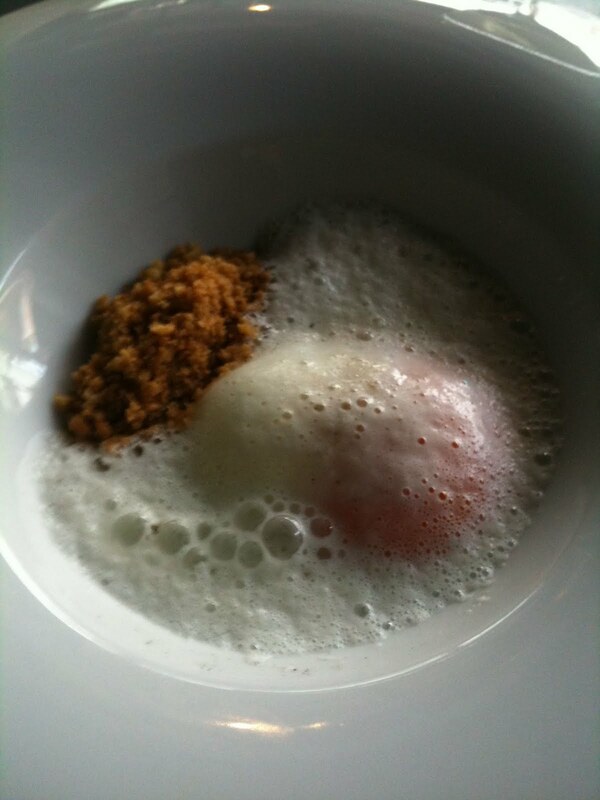 I liked the concept of the 62°c egg and bacon crumble that had an interesting foam and texture…but it amused me rather than impressed my taste buds (though egg = good in my books). I was surprised to be getting filled up – so only ordered one more dish (meaning that if I’m back in Adelaide, I’m making a beeline to this restaurant. I’d like to try every dish!). 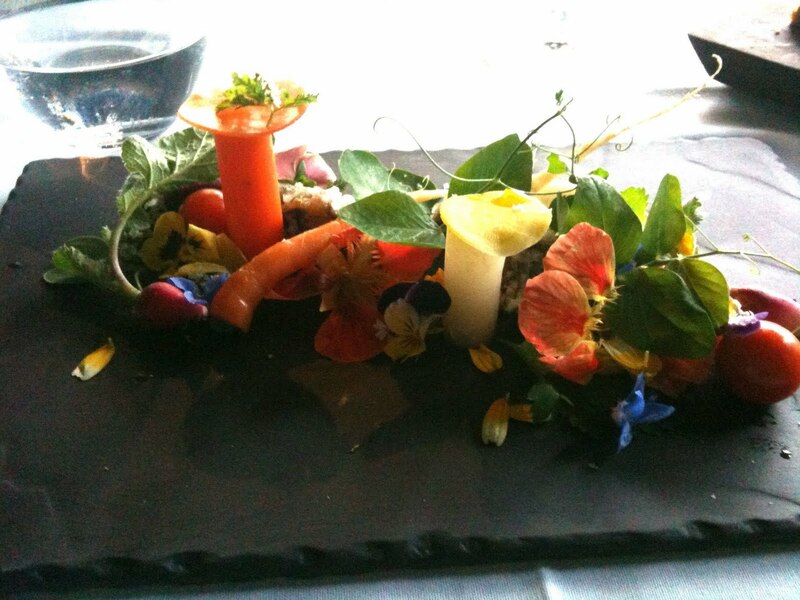 The signature dish is the ‘Vegetable patch’ – Snails, Herbs, Soil, Flowers, Raw and Pickled Vegetables. I had to show you two views to show beautiful it was. I would rate this as the most engaging plate of food I’ve had all year. 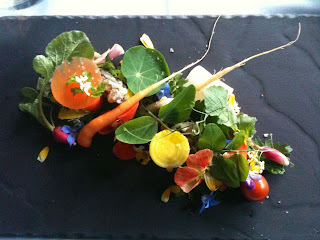 Everything was edible, all of the gorgeous little flowers and petals, the tiny tomatoes, radishes, and carrots, the curlique sprouts. The rolls of pickled vegetables arranged to appear as the stems of mushrooms. Hidden among the foliage, four tempura battered snails. Ah, and some coffee flavoured “soil”. For me, this wasn’t just eating, it was an experience – colour, flavour, texture – and an invitation to take time to taste each component of the dish. As far as eating goes, pork belly excites me more than a carrot, no matter how fresh or local or perfectly formed – but as I said, this was more than eating, and I was very impressed. Wow, Thanks for your comments Andy, I’m so glad there are people out there noticing what the chef is trying to achieve. You are very welcome any time and I hope you pop in the next time you are in Adelaide, make sure you say hello to me I’d like to shake your hand for your views.